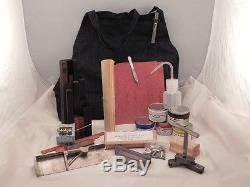 Background: This kit is designed for first-time or newer press buyers. 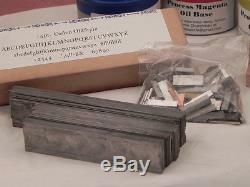 There are three types of kits: 1 Tabletops 2 Floor model 3 Proof press. What's included in a Tabletop Starter's Kit. Three (3) Wickesham speed quoins. One (1) key for the Wickersham quoins. 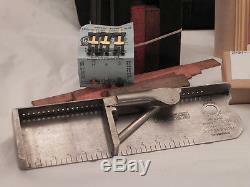 One (1) new Gaebel 6 stainless steel line gauge. Three (3) new spring tongue gauge pins for the tympan paper/press. One (1) font of NEW, PACKED type (choose one). 14 point Caslon Old Style. 14 point Goudy Old Style. 14 point 20th Century Medium. 14 point Sans Serif Light. Styles are easy to read and staples in any printshop! Fonts are new in the package and include uppers, lowers, points, figures and punctuation. 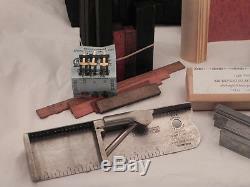 A complete array of assorted 14 point spacing and quads, thin spacing, leads/slugs. 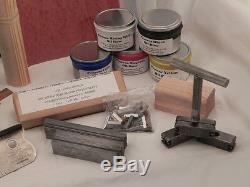 The variety included is based on the size of your press, which we need you to indicate when purchasing this kit. 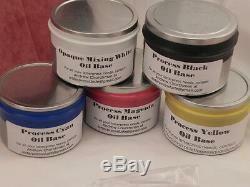 Can of ink in your choice of cyan, yellow, magenta, black or opaque mixing white. 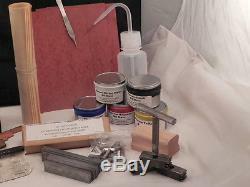 This convenient, high quality ink mixing kit is a way to play with color mixing on a budget. For most hobbyists, this amount of ink can last for many dozens of jobs (depending on your frequency of printing). 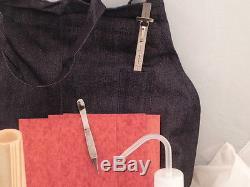 New, heavy duty denim printers apron with pockets for line gauges, tools, pencils, etc. A generous supply of tympan paper. New Nalgene goose-neck plastic clean-up bottle to dispense solvent to clean press after job. New stainless steel printers tweezers for snagging small type, spacing, etc. 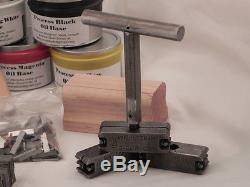 New hard maple planer block to level the type in form. FLOOR MODEL AND PROOF PRESS KITS HAVE LARGER/HEAVIER DUTY VERSIONS AND MORE VOLUME OF SELECT ITEMS ABOVE. We are happy to CUSTOMIZE kits--add and subtract any items! And I'll promptly respond with pricing. I will need your press size, ink, and font selections. In the message box that opens, please indicate the following three things. 1 Chase size of your press. 2 Color of ink desired. 3 Font of type choice. Also ask me about my large selection of tabletop presses + kit specialswe regularly have 50 -100 tabletop presses in inventory and can likely match a press to most any letterpress budget and size needs. 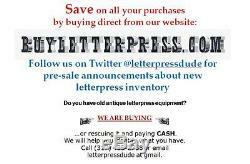 Beyond that, if its letterpress related, we can provide itfloor models, type (1,000s of fontswood and lead), ornaments, deco border, monogram sets, proof presses, press and equipment parts, ink, cutters, cuts, dies, cabinets, cases, furniture and furniture cabinetsyou get the picturejust ask, well do our best to handle all requests! 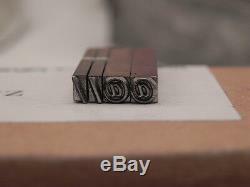 The item "Letterpress Hobbyist's Starter's Kit C & P pilot kelsey" is in sale since Friday, June 3, 2016. This item is in the category "Business & Industrial\Printing & Graphic Arts\Printing & Graphic Essentials\General Accessories". The seller is "asteele71" and is located in Indianapolis, Indiana. This item can be shipped worldwide.